A prominent Santa Fe media person delivered a comprehensive briefing package on the aerosol issue to Representative Thomas Udall of New Mexico on September 2 1999. This 3 ring binder package of materials was directly delivered to him in person, and it included photographs, testimonies, research references and petitions for congressional action. The request for prompt evaluation of the material and for response to the citizens of New Mexico was made at that time. No response of any type was forthcoming through November of 1999. On November 30 1999 a second letter was sent to Mr. Udall by this same citizen, reiterating the need for a prompt and thorough public response to the issues raised. 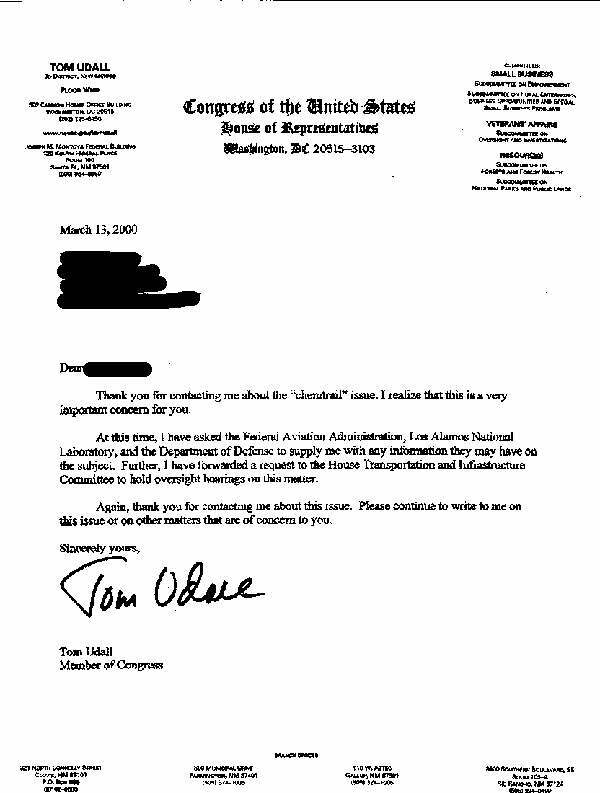 No such response by Mr. Udall has been received to this date. A third letter has now been generated to once again emphasize the duty and obligation of Mr. Udall to respond to the materials and correspondence which have repeatedly been delivered to him. Until action is provided to the contrary, it is now to be interpreted by the citizens of New Mexico that Mr. Udall refuses to respond to information provided to him on the aerosol issue. Full disclosure is demanded on the part of all public servants surrounding this national controversy. This lack of action by Mr. Udall, even though the requests have been made in a courteous and formal fashion, is now to be publicly disclosed to the widest audience possible. Citizens of New Mexico as well as of the United States are encouraged to seek full accountability for Mr. Udall’s delays, and to continue to seek his immediate and prompt reply to the materials which have been made available to him. A spokesperson for Representative Udall has commented on this letter within an article published in the Santa Fe New Mexican newspaper in the Spring of 2000. The spokesperson has stated that Mr. Udall has not personally requested that any such congressional hearings take place, and that Mr. Udall has only “forwarded” such a request to Congress on behalf of the original constituent, and that he personally has not asked for hearings to be held. Readers may judge for themselves the intent of the formal letter posted above.